A 24 hour tourist package from Hanoi to Halong Bay was one of the highlights of my trip to Vietnam. Halong Bay, 100Km south of the Chinese border is a World Heritage Site – a huge area of limestone casts and tiny islands soaring spectacularly out of the ocean. There are a few floating villages, where people make their living by fishing and selling to tourists, and it’s an ideal haunt for pirates! But best of all were the tourist boats which must have dated from a more elegant past – beautifully carved teak woodwork, each cabin with an elegant little shower & toilet – I could definitely live in one of these…. 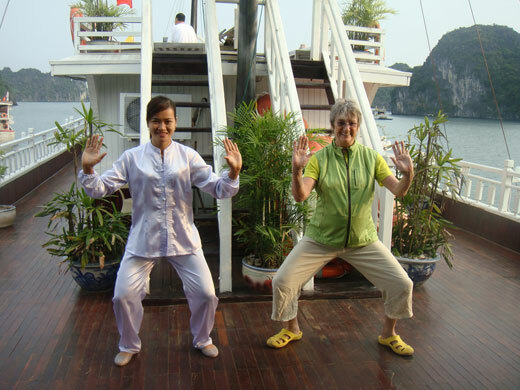 And the icing on the cake – one of the staff who during the day served food and cleaned the cabins turned into a martial arts Sifu every morning, being ferried from one boat to the next dressed in her white silk outfit to teach us tourists a simple but very effective routine of tai chi/chi gong exercises.